The haters will tell you that Mexicans cannot amount to anything – the truth is that our young people are just as capable as anyone else. In the video above, you will meet Gloria Montiel, a graduate of Santa Ana High School. She was accepted into Harvard – and she finished an undergraduate degree. Now she wants to go to Harvard’s graduate university, to get a Master’s degree in education, but the cost is $50,000. Because Gloria is undocumented, she cannot avail herself of the student loans that the rest of us take for granted. But Gloria isn’t giving up! Her friends are helping her raise $39,000 so she can finish school and get her Master’s degree. 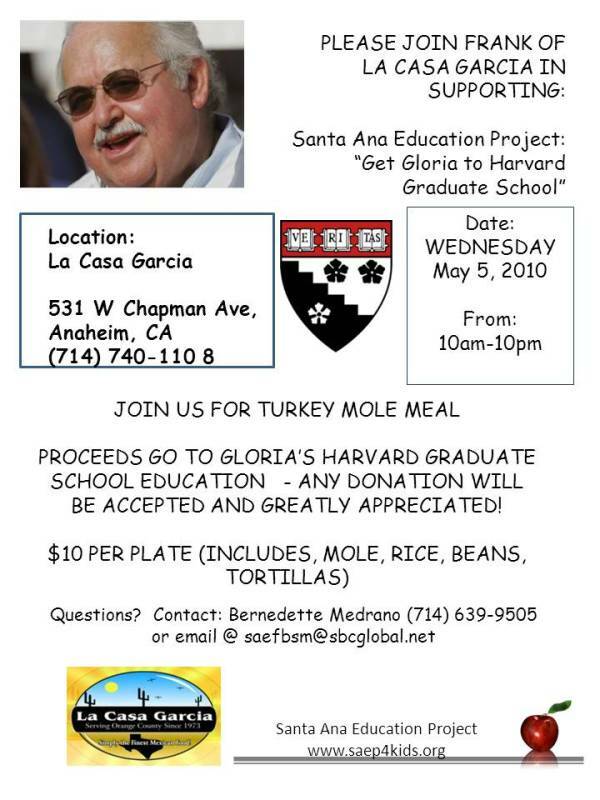 You can help out by clicking here and printing out the event flier, and going to La Casa Garcia tomorrow, Wednesday, May 5, anytime from 10 am to 10 pm, to enjoy a $10 plate of Turkey Mole, with the works, including rice, beans and tortillas. La Casa Garcia is located at 531 W. Chapman Ave., in Anaheim. You can find out more about Gloria by clicking here. You can also contact Bernedette Medrano at 714-639-9505, if you want to meet with Gloria. Thanks for joining us at Polly’s tonight! Gloria will be on Univision on Friday morning (their early morning show)! Including Facebook ($780) and we’ve raised $2,430 so far! Onward and upward! If Loretta Sanchez backed the DREAM Act, maybe she could help it passed. If it passed as it should have years ago, Gloria would be a citizen by now. If she were a citizen, she could get the normal financial aid & loans that hardworking citizens get to finish grad school. So help Gloria, but also fight for the DREAM ACT! why the heck should anyone pay for anyone to go to college…get a student LOAN! Because she’s undocumented if only you cared and were smart enough to read what’s already been said! She made it this far . Use your anger in a positive way if that makes any sense to you. 🙂 I LOVE YOUR DRIVE AND YOU HAVE ALWAYS BEEN A GREAT AND INSPIRING FRIEND:) God bless us all. If you put your heart mind And soul in it you can do it too. Gloria, I am so proud of you. You can do it. You can do whatever you want. Never stop following your dreams. Show everyone that a Latin, or Mexican or anybody from any nationality can go to Harvard. Of course that we are going to help you. Many students that can pay will wish to be accepted to Harvard, but they are not enough smart like yo. Always have in your mind that nothing can stop to accomplish your dream.